Although I went on the course at West Dean College last summer I was reminded of it again this week as I’ve booked my mum a surprise birthday place on the tapestry course. My own foray into ceramics, something which I haven’t tackled since teacher training 15 years ago – 20 hormonal boys doing GCSE ceramics in a very small, kiln heated classroom by a trainee teacher with a hatred of the feeling of dry clay. I vividly remember helping students with their constructions and immediately washing my hands. Fortunately the placement finished before I developed a full on obsession for hand washing. Anyway I’ve been interested in combining print and ceramics for some time so plunged in with an excellent intensive weekend course at West Dean near Chichester in West Sussex in Hand built Ceramics with Coloured Slips taught by Jane Abbott an accomplished ceramicist and teacher. The resulting pieces were a little rough around the edges, as you can see but not bad after such a long break away. I experimented with abstract application of coloured slips and tried to stick with simple motifs which recur in my print work. My favourite part was transfer printing, by painting the premixed slips onto newsprint first they were more controllable than brushing straight on. The marks could then be applied onto the 3D form of the pots in layers. 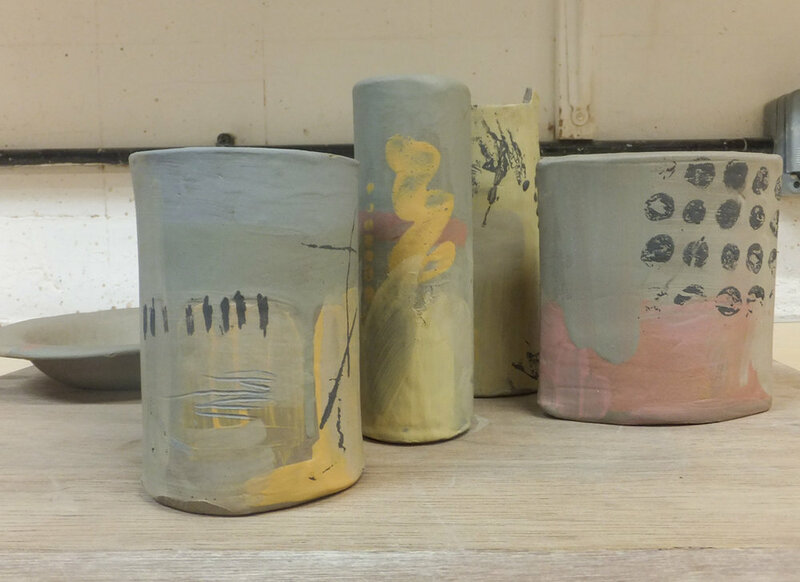 I also used the same paper process to trace monoprint onto the surfaces of the pots before firing and glazing. A skilled task thankfully completed out of site by the technical staff following Jane’s suggestions for suitable finishes. Some of the colours and techniques came out better than others but it got me thinking about the crossovers between print and ceramics. A bit of online research revealed Jason Bige-Burnett’s ‘graphic clay’ book as a go to manual from an expert in this field with a graphic, contemporary approach. The book is equal parts comprehensive instruction manual and inspiration featuring not only Bige-Burnetts work but other notable names in the field of graphic ceramics. At this point I’m forbidden (with a stern look from my other half) from straying into any new art media simply because of time and space issues, with a young family, job and all life’s usual pressures I will concede now is not a good time. 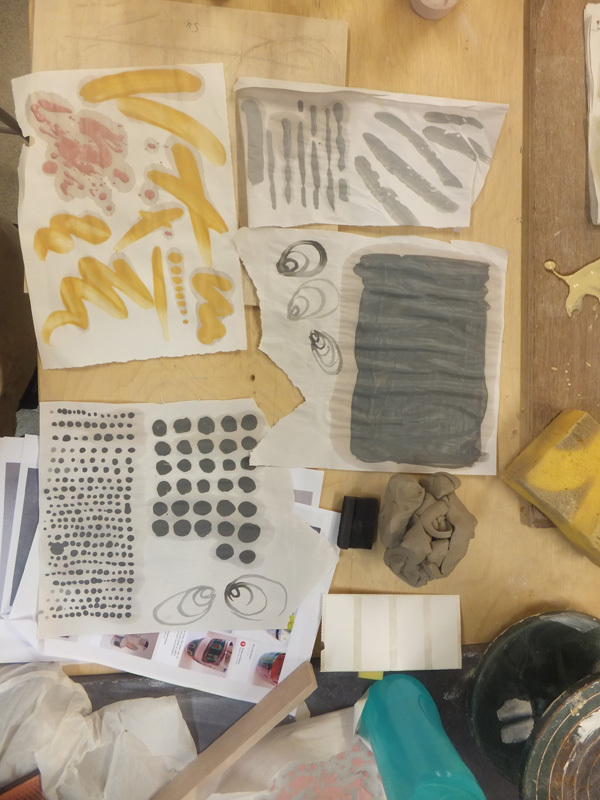 However both Jane Abbot’s course and Bige-Burnett’s book is so inspiring that the idea of transfer printing hasn’t been so much forgotten as moved into a long list of ‘saved for later’ future projects…..